Philippine Long Distance Telephone Company (PLDT) has confirmed that it will be acquiring a majority stake in the Philippine Star (PhilStar). In a disclosure to the Philippine Stock Exchange last Wednesday, PLDT said it will increase its stake in the newspaper from 20% to 51%. The additional shares will be secured through Hastings Holdings Inc, a subsidiary of Mediquest Holdings. Before the deal, the Belmonte family owned 51% of PhilStar. InterAksyon.com, the online news portal of PLDT’s sister company TV5, reports that PhilStar president Miguel Belmonte intends to keep a 20% stake. “We confirm that Hastings Holdings Inc, a 100 percent subsidiary of Mediquest Holdings Inc, which in turn is a wholly owned entity of the PLDT Beneficial Trust Fund, has signed an agreement to acquire an additional equity interest in The Philippine Star,” the disclosure read. PLDT expands its hold in three of the country’s major newspapers. Mediaquest also owns 30% of Businessworld, 12% of the Philippine Daily Inquirer. A unit of the PLDT Retirement Fund, Mediaquest serves as the investment vehicle of media assets owned by Manuel Pangilinan, the chairman of both PLDT and Mediaquest. The company also manages TV networks TV5 and the National Broadcasting Corporation, radio network GV Broadcasting Systems and digital cable company Cignal TV. In addition, it has a 30% stake in Unitel Group which manages two production houses. 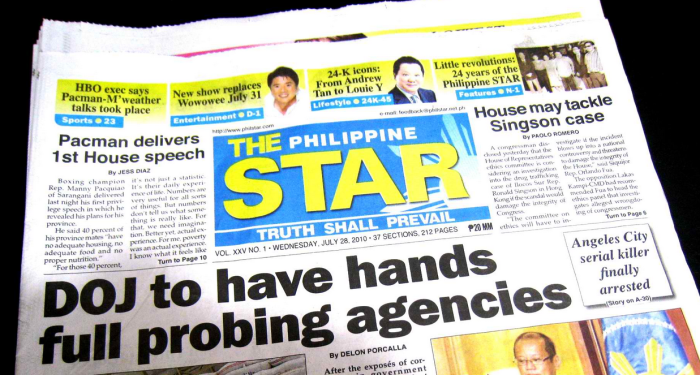 Meanwhile, the Belmonte family publishes the tabloids Pilipino Star Ngayon and Pang-Masa in addition to the PhilStar. They also publish Cebu’s oldest English-language newspaper, The Freeman, as well as the tabloid Banat News.